1. 모델링 마스크 파우더와 고무볼, 스파츌라, 차가운 정제수를 준비합니다. 2. 마스크 한 컵 분량을 덜어 고무볼에 넣고 정제수 1~1.5 컵을 부어 스파츌라로 잘 섞어 흐르지 않게 갭니다. 3. 스파츌라를 이용하여 턱, 볼, 코, 이마 순으로 도포합니다. 4. 약 20~30분 경과한 뒤 마스크를 아래에서 위로 떼어냅니다. 5. 얼굴에 남은 마스크 잔여물은 토너를 적신 화장솜 또는 젖은 해면으로 부드럽게 제거합니다. 6. 토너, 아이크림, 에센스, 크림순으로 마무리합니다. * 일주일에 1~2회 적용하며 마스크 도포 전 에센스나 앰플을 도포하시면 시너지 케어에 도움을 줍니다. Tea tree extract and our company Ellipeace energy (patent) provide immediate calming care for troubled and excess sebum secretion skin. DIRECTIONS : After cleansing, pour 15~20 grams of the powder into a rubber bowl, mix with 30~35ml cold/warm water(depends on your preference). Stir rigidly with a plastic spatula until a smooth uniform paste forms, then apply evenly on the face. 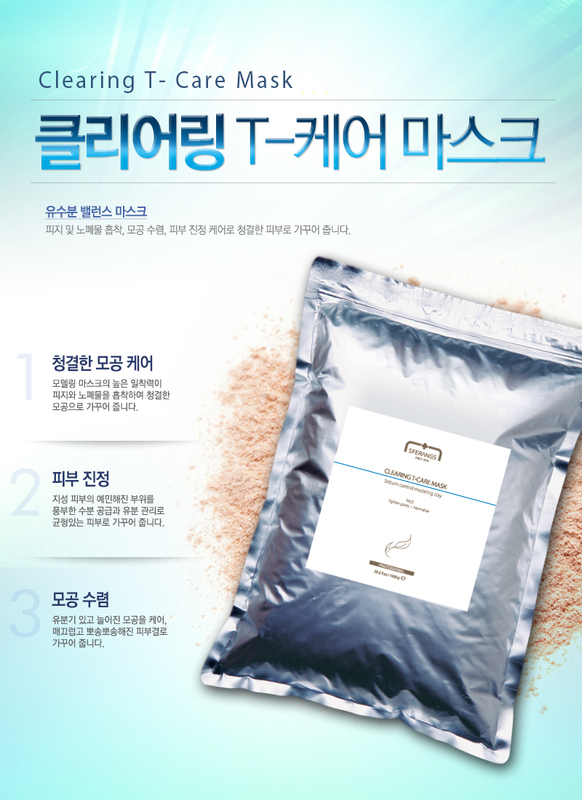 After 20~25 minutes, peel off the mask and clean the excess mask residue with clearing T-care toner.